Roots in Ripon: What a Rush! Well, school is back in session throughout most of the United States. Going to school in the 50s and 60s our system of attendance was based upon the traditional model. The school year began in September (usually on or around my birthday – September 5), and ended in early June. Summer was an eternity of baseball, swimming, fishing, bike trips and a host of other Huck Finn/Tom Sawyer activities that boys did in those days. Our two five-year-old granddaughters, Alyssa and Brooklyne, have just started kindergarten. Actually, as of this writing, Alyssa started school on the 14th and Brooklyne begins on the 19th. Let me tell you – times have changed. I was to pick up Alyssa today at the end of school. A parent or grandparent, or whoever is authorized to pick up the child, arrives at the school en masse to be identified visually by the child before the teacher releases them from the school’s custody. Each child is asked by the teacher at the gate, “Do you see someone here to pick you up?” If the answer is yes, then the child will say who that person is. “That’s my granddaddy!” Alyssa said. If they say no, then they are kept inside the fence until the person arrives to pick them up. I used to walk to and from school, kicking a can down the street, and never thought anything of it. 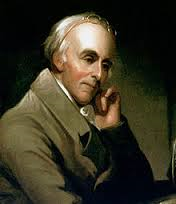 A friend from many years back, knowing my love of history, sent me a story of Dr. Benjamin Rush, born in Philadelphia on December 24, 1745, and died in Philadelphia on April 19, 1813. 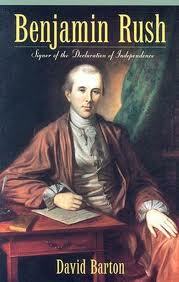 Do you remember him from American History? No? Well allow me to fill you in on this most remarkable man, a man who has been marginalized in our American history. Doctor; medical educator (“Father of American Medicine”); chemist; humanitarian; politician; author; temperance advocate; abolitionist (he and Benjamin Franklin helped organize the first Anti-Slavery society); signer of the Declaration of Independence; one of our nation’s Founding Fathers; founding member of America’s first Bible Society; helped begin the American Sunday School movement; he held multiple university professorships; and a strong advocate of free public schools for all youth (“The Father of Public Schools Under the Constitution”). In addition, he helped establish five schools of higher learning: the College of Philadelphia; the University of the State of Pennsylvania; the Young Ladies’ Academy of Philadelphia; Dickinson College; and Franklin College. It was Dr. Rush’s intent to guarantee that children in our public school system receive a sound and solid academic education based on God’s Word, the Bible. To ensure this, Dr. Rush wrote a paper expressing in detail the importance of using the Bible as the basis of our entire educational system. Consider these words from his paper, “Thoughts Upon the Mode of Education Proper in a Republic,” 1786, by Dr. Benjamin Rush. “I conceive the education of our youth in this country to be peculiarly necessary in Pennsylvania while our citizens are composed of the natives of so many different kingdoms in Europe. Our schools of learning, by producing one general and uniform system of education, will render the mass of the people more homogeneous and thereby fit them more easily for uniform and peaceable government. “I proceed, in the next place, to inquire what mode of education we shall adopt so as to secure to the state all the advantages that are to be derived from the proper instruction of youth; and here I beg leave to remark that the only foundation for a useful education in a republic is to be laid in RELIGION. Without this, there can be no virtue, and without virtue there can be no liberty, and liberty is the object and life of all republican governments. “Such is my veneration for every religion that reveals the attributes of the Deity, or a future state of rewards and punishments, that I had rather see the opinions of Confucius or Mohammed inculcated upon our youth than see them grow up wholly devoid of a system of religious principles. But the religion I mean to recommend in this place is the religion of JESUS CHRIST. “I do not mean to exclude books of history, poetry, or even fables from our schools. They may and should be read frequently by our young people, but if the Bible is made to give way to them altogether, I foresee that it will be read in a short time only in churches and in a few years will probably be found only in the offices of magistrates and in courts of justice.” How prescient he was! Let me strongly encourage you to read this paper written by Dr. Rush http://www.schoolchoices.org/roo/rush.htm. Particularly, take note of his views in regards to the proper education of women in America. Wow! I believe I will need to spend more time sharing my discoveries of this amazing man in future articles.